Secure l that a time-varying magnetic field acts as a source b induced emf’s in conductors and transform. g the displacement current discovered by ws that a time-varying electric field acts as mutual interaction between the two fields equations, presented in Section 30-8. IX a magnetic field is changing with L> ,in adjacent regions of space. We are led (as Maxwell was) to consider the possibility of an electromagnetic disturbance, consisting of time-varying electric and magnetic fields, that can propagate through space from one region to another, even when there is no matter in the intervening region. Such a disturbance, if it exists, will have the properties of a wave, and an appropriate term is electromagnetic wave. Such waves do exist; radio and television transmission, light, x rays, and many other kinds of radiation are examples of electromagnetic aves. Our goal in this chapter is to see how the existence of such waves is related to the principles of electromagnetism that we have studied thus far and to examine the properties of these waves. 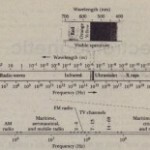 As so often happens in the development of science, the theoretical understanding of electromagnetic waves originally took a considerably more devions path than the one just outlined. In the early days of electromagnetic theory (the early nineteenth century), two different units of electric charge were used, one for electrostatics and the other for magnetic phenomena involving currents. In the system of units nsed at that time, these two units of charge had different physical dimensions. Their ratio had units of velocity, and measurements showed that the ratio had a numerical value that was precisely equal to the speed of light, 3.00 x 108 mls. At the time, physicists regarded this as an extraordinary coincidence and had no idea how to explain it. 33-1 Electric field lines of a point charge oscillating in simple harmonic motion. The field lines are viewed at four instants during an oscillation period T in a plane containing the point charge’s trajectory. At t = 0 the point charge is moving upward through its equilibrium position. The arrow in each part shows one “kink” in the lines of E, which propagates outward from the point charge. For clarity the magnetic field lines are not shown; these are circles that lie in planes perpendicular to these figures and that are concentric with the axis of oscillation. every instant (the exception is when the charge is passing through its equilibrium position). Figure 33-1 shows some of the electric field lines produced by such an oscillating point charge. Field lines are not material objects, but you may nonetheless find it helpful to think of them as behaving somewhat like strings that extend from the point charge off to infinity. Oscillating the charge up and down makes waves that propagate outward from the charge along these “strings.” Note that the charge does not emit waves equally in all directions; the waves are strongest at 90° to the axis of motion of the charge, while there are no waves along this axis. This is just what the “string” picture would lead you to conclude. These is also a magnetic disturbance that spreads outwards from the charge; this is not shown in Fig. 33-1. Becausethe electric and magnetic disturbances spread or radiate away from the source, the name electromagnetic radiation is used interchangeably with the phrase “electromagnetic waves.” Electromagnetic waves with macroscopic wavelengths were first produced in the laboratory in 1887 by the German physicist Heinrich Hertz. As a source of waves, he used charges oscillating in L-C circuits of the sort discussed in Section 31-6; he detected the resulting electromagneric waves with other circuits tuned to the same frequency. wavelength-frequency relation v = )”/. He established that their speed was the same as that of light; this verified Maxwell’s theoretical prediction directly. The SI unit of frequency is named in honor of Hertz: One hertz (1 Hz) equals one cycle per second. The possible use of electromagnetic waves for long-distance communication does not seem to have occurred to Hertz. It remained for the enthusiasm and energy of Marconi and others to make radio communication a familiar household experience. In a radio transmitter, electric charges are made to oscillate along the length of the conducting antenna, producing oscillating field disturbances like those shown in Fig. 33-1. 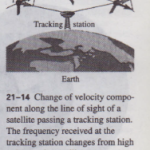 Since many charges oscillate together in the antenna, the disturbances are much stronger than those of a single oscillating charge and can be detected at a much greater distance. In a radio receiver the antenna is also a conductor; the fields of the wave emanating from a distant transmitter exert forces on free charges within the receiver antenna, producing an oscillating current that is detected and amplified by the receiver circuitry. For most of the remainder of this chapter our concern will be with electromagnetic waves themselves, not with the rather complex problem of how they are produced. In Section 33-9 we’ll describe in some detail the character of the electromagnetic waves produced by one important type of transmitting antenna.